Sitting by the fireplace with a bowl of hot chili can take the chill off blustery winter weather. This southwest favorite, which often includes ground beef, beans and ingredients such as cumin and hot peppers, might date back to the ancient Aztecs, according to the International Chili Society. Every chili cook has a favorite variation of this hearty meal, which contains a moderate number of calories. The precise caloric count of a bowl of chili with beef and beans varies, according to the cook who prepares it. However, the U.S. Department of Agriculture reports that a standard, 182-gram serving size of meat-and-bean chili contains 286 calories. 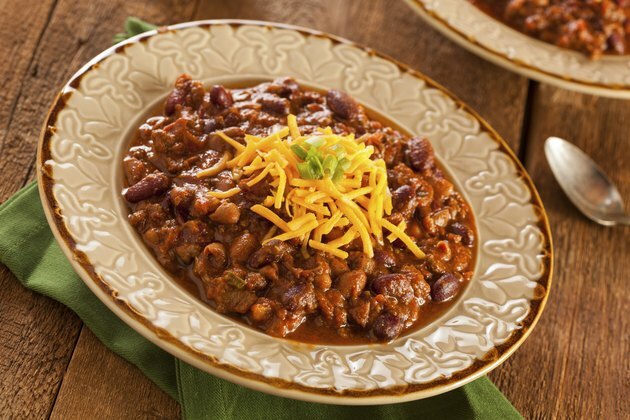 If you wish to add some cheese to the top of your chili, doing so increases the meal's caloric content. The USDA notes that a quarter of a cup of shredded cheddar cheese adds an additional 114 calories to the meal. How Many Calories Are in Chili from Wendy's?